When I saw this book on the table dedicate to Christmas in my local Waterstones, I knew I had to buy it. 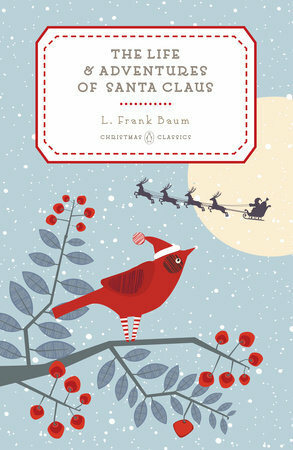 I had never heard of it before but just the premise – Santa grew up in Oz. This was made to be my dream Christmas book and was an absolutely glorious start to the festive season for me. I absolutely loved this. The premise is wonderful, a young baby is found by a nymph and she wished to raise him. As he grows he makes it his aim to make the poor children happy, then it spreads to all children. Each chapter in the middle towards the end follows the start of a new Chistmas tradition, firstly presents, the adoption of the name Santa Claus, chimneys, stockings, trees and ultimately, it addresses why Santa is old and grey. This is a completely different approach to the story of Santa Claus and it was wonderful. The main message is that Claus loves children and wants to make all of them feel happiness. Even more than a century after it was published I think the core desires of children are the same and Baum himself said once “all children need love and deserve kindness”. I have to say I would have loved this book where I between 8 and 10, when my belief in Santa wavered because it does explain why parents help Santa – it’s so he can deliver presents to more people! I adored this and will be rereading it every Christmas. I will probably also read it to my cousins, or at least paraphrase it for them as they’re only 6 and 3! This book is a solid 5* for me, it had it’s flaws but ultimately I adored it; it definitely has me wanting to read more in the Penguin Christmas series!